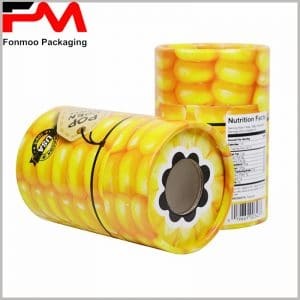 Small printed cardboard tube boxes packaging for food, its packaging design can sometimes start from the product itself, the main design content is mainly based on high clear product image. This food tube packaging design method looks very old-fashioned, without the use of bronzing or gradually changing color processing and other creative, but its inherent attractiveness remains the best. Because more than 90% of consumers want to intuitively understand the style of food or other products through packaging, and HD product images are undoubtedly the most attractive. For a specific brand of custom packaging, if there are only pictures, there is no other additional promotional information, it will also give consumers doubts. Because the same pictures and products, there are a lot of brands and businesses in the competition, consumers need to choose a brand and product worthy of their trust. Logos are printed on the packaging to take full advantage of the brand value; full product descriptions will allow consumers to understand more information and promote purchases. Since the raw materials used are 250g cardboard and 80g copper paper, the printing process used is four-color printing, and the manufacturing cost will be 20% less than using cardboard round boxes with special processes and special materials.